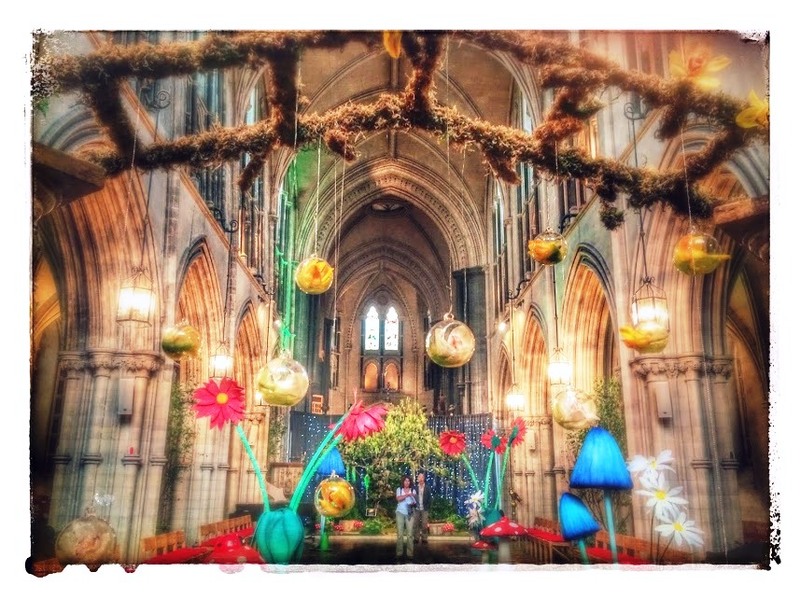 Christ Church Cathedral has abuzz today with the Dublin Garden Festival, which opened yesterday [19 June 2015] and continues tomorrow [21 June 2015]. The theme of this year’s festival is all about fairy tales and the cathedral is adorned with floral installations and props that have transformed into an enchanting wonderland. Hundreds of flowers have been used to create a stunning display of contemporary and traditional floral designs, inspired by the award-winning floral artist Christopher White. Outdoors there is a busy summer market with food, craft and garden stalls in grounds of the cathedral, which provides a unique architectural backdrop. Visitors are being offered gardening advice by gardening and horticultural experts with talks each day in the Cathedral Music Room. The stands in the grounds outside included horticultural displays, food produce, urban gardens, birds of prey, a petting zoo, craft demonstrations, live entertainment and an outdoor artisan food tent full of gourmet food including afternoon tea. The guest speakers include broadcaster Eamon Dunphy; former Green Party TD Trevor Sargent, author of Trevor’s Kitchen Garden, gardening expert Helen Dillon, landscape architect Jane McCorkell, and Chelsea Flower Show medallist Christopher White. The festival continues tomorrow [Sunday] from 12.30 p.m. Between my time in the cathedral in the early and late afternoon, I was in the Tara Street offices of The Irish Times for the first time. I left the staff of The Irish Times in 2002, and in October 2006, the newspaper moved from D’Olier Street to these new office in Tara Street. The old Irish Times clock, that had been moved in the past from Westmoreland Street to D’Olier Street, hangs on the new building as “sign of the times” and a sign of continuity. There was a warm welcome from old friends and former colleagues, but it was sad occasion, with a meeting on the top floor. In all, 85 people were present the meeting and voted overwhelmingly to wind up or dissolve the Irish Times Credit Union Ltd, which was founded almost half a century ago in 1969. As one former employee present observed at the meeting, it is a sad day when the regulators mysteriously allow the Irish banks to sink the Irish economy yet squeeze out well-run, not-for-profit community groups like our small credit unions. As I walked along the quays between Christ Church Cathedral and Tara Street, I could sympathise with the many anti-austerity protesters waving Greek flags. Looking at today’s crises, Shelley might simply say: “We are all Greeks.” For if we let the international financiers get away with their plotting and scheming against Greece this month, who is going to be their next target next month? He says the “Eurozone moves in a mysterious way” so that unelected officials make decisions and block the open flow of information to elected politicians who should be the true decision-makers. It all makes the Wonderland in Christ Church Cathedral an innocent delight.